1 H None No Power Seat 1 H is a standard Business Class seat however, the position of the bassinet and proximity to the lavatories and galleys may be bothersome. 1 K None No Power Seat 1 K is a standard Business Class seat however, the position of the bassinet and proximity to the lavatories and galleys may be bothersome. 45 A None No Power Seat 45 A is a standard Economy Class seat. The tray table is in the armrest, making the armrest immovable and slightly reducing seat width. The position of the bassinets and proximity to the lavatories and galley may be bothersome. 45 C None No Power Seat 45 C is a standard Economy Class seat. The tray table is in the armrest, making the armrest immovable and slightly reducing seat width. The position of the bassinets and proximity to the lavatories and galley may be bothersome. 45 D None No Power Seat 45 D is a standard Economy Class seat. The tray table is in the armrest, making the armrest immovable and slightly reducing seat width. The position of the bassinets and proximity to the lavatories and galley may be bothersome. 45 E None No Power Seat 45 E is a standard Economy Class seat. The tray table is in the armrest, making the armrest immovable and slightly reducing seat width. The position of the bassinets and proximity to the lavatories and galley may be bothersome. 45 G None No Power Seat 45 G is a standard Economy Class seat. The tray table is in the armrest, making the armrest immovable and slightly reducing seat width. The position of the bassinets and proximity to the lavatories and galley may be bothersome. 45 H None No Power Seat 45 H is a standard Economy Class seat. The tray table is in the armrest, making the armrest immovable and slightly reducing seat width. The position of the bassinets and proximity to the lavatories and galley may be bothersome. 45 K None No Power Seat 45 K is a standard Economy Class seat. The tray table is in the armrest, making the armrest immovable and slightly reducing seat width. The position of the bassinets and proximity to the lavatories and galley may be bothersome. 46 A None No Power Seat 46 A is a standard Economy Class seat, however this seat is missing a window. 46 D None No Power Seat 46 D is a standard Economy Class seat, however the legroom may be misaligned due to the transition from 3 seats in front to 4 seats in this row. The tray table is in the armrest, making the armrest immovable and slightly reducing seat width. 46 E None No Power Seat 46 E is a standard Economy Class seat, however the legroom may be misaligned due to the transition from 3 seats in front to 4 seats in this row. The tray table is in the armrest, making the armrest immovable and slightly reducing seat width. 46 F None No Power Seat 46 F is a standard Economy Class seat, however the legroom may be misaligned due to the transition from 3 seats in front to 4 seats in this row. The tray table is in the armrest, making the armrest immovable and slightly reducing seat width. 46 G None No Power Seat 46 G is a standard Economy Class seat, however the legroom may be misaligned due to the transition from 3 seats in front to 4 seats in this row. The tray table is in the armrest, making the armrest immovable and slightly reducing seat width. 46 K None No Power Seat 46 K is a standard Economy Class seat, however this seat is missing a window. 58 D None No Power Seat 58 D is a standard Economy Class seat however, the proximity to the lavatories may be bothersome. 58 E None No Power Seat 58 E is a standard Economy Class seat however, the proximity to the lavatories may be bothersome. 58 F None No Power Seat 58 F is a standard Economy Class seat however, the proximity to the lavatories may be bothersome. 58 G None No Power Seat 58 G is a standard Economy Class seat however, the proximity to the lavatories may be bothersome. 59 A None No Power Seat 59 A is a standard Economy Class seat however, the proximity to the lavatories may be bothersome. 59 C None No Power Seat 59 C is a standard Economy Class seat however, the proximity to the lavatories may be bothersome. 59 H None No Power Seat 59 H is a standard Economy Class seat however, the proximity to the lavatories may be bothersome. 59 K None No Power Seat 59 K is a standard Economy Class seat however, the proximity to the lavatories may be bothersome. 61 D None No Power Seat 61 D is a standard Economy Class seat however, the position of the bassinets and proximity to the lavatories may be bothersome. 61 E None No Power Seat 61 E is a standard Economy Class seat however, the position of the bassinets and proximity to the lavatories may be bothersome. 61 F None No Power Seat 61 F is a standard Economy Class seat however, the position of the bassinets and proximity to the lavatories may be bothersome. 61 G None No Power Seat 61 G is a standard Economy Class seat however, the position of the bassinets and proximity to the lavatories may be bothersome. 62 A None No Power Seat 62 A is a standard Economy Class seat that has restricted legroom due to the protrusion of the exit door. The proximity to the lavatories may be bothersome. 62 K None No Power Seat 62 K is a standard Economy Class seat that has restricted legroom due to the protrusion of the exit door. The proximity to the lavatories may be bothersome. 70 D None No Power Seat 70 D is a standard Economy Class seat however, other flyers tend to bump into this seat. 70 G None No Power Seat 70 G is a standard Economy Class seat however, other flyers tend to bump into this seat. 71 A None No Power Seat 71 A is a standard Economy Class seat, however this seat may feel cramped due to the curvature of the plane. 71 D None No Power Seat 71 D is a standard Economy Class seat, however the legroom may be misaligned due to the transition from 4 seats in front to 3 seats in this row. 71 E None No Power Seat 71 E is a standard Economy Class seat, however the legroom may be misaligned due to the transition from 4 seats in front to 3 seats in this row. 71 G None No Power Seat 71 G is a standard Economy Class seat, however the legroom may be misaligned due to the transition from 4 seats in front to 3 seats in this row. 71 K None No Power Seat 71 K is a standard Economy Class seat, however this seat may feel cramped due to the curvature of the plane. 75 A None No Power Seat 75 A is a standard Economy Class seat that may have limited recline. The proximity to the galleys may be bothersome. 75 C None No Power Seat 75 C is a standard Economy Class seat that may have limited recline. The proximity to the galleys may be bothersome. 75 D None No Power Seat 75 D is a standard Economy Class seat that may have limited recline. The proximity to the galleys may be bothersome. 75 E None No Power Seat 75 E is a standard Economy Class seat that may have limited recline. The proximity to the galleys may be bothersome. 75 G None No Power Seat 75 G is a standard Economy Class seat that may have limited recline. The proximity to the galleys may be bothersome. 75 H None No Power Seat 75 H is a standard Economy Class seat that may have limited recline. The proximity to the galleys may be bothersome. 75 K None No Power Seat 75 K is a standard Economy Class seat that may have limited recline. The proximity to the galleys may be bothersome. In Business, each seat has a personal touchscreen monitor that features AVOD. TV shows, documentaries, and movies are all available on flights lasting longer than three hours. In Economy, A variety of films are played on overhead screens; located throughout the aircraft. 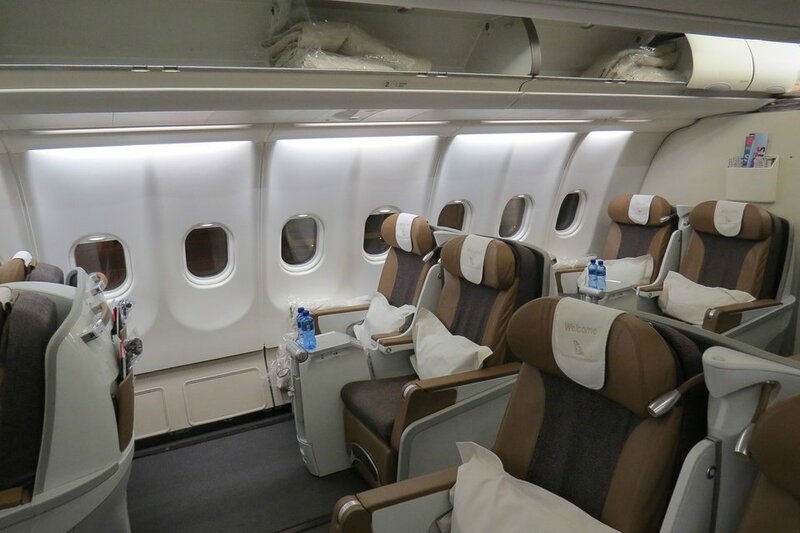 This South African Airways Airbus A340-200 features a two class configuration; with 24 flat bed seats in Business and 226 Economy Class seats, for a total seating capacity of 250 passengers. This aircraft is primarily used on a variety of long haul services. Flight SA264 JNB-MUC. This plane seems to be used by SAA only when A346 & A343 cannot be used. Inconfortable seats, no personal IFE but old TV screens repeating the same movies. This makes long haul flights particulary boring. Agree with an earlier comment - it is inexcusable for SAA to use aircraft on a long haul (in this case PER/JNB = 11.5 hours) without individual personal entertainment. Repeating the same set of movies a number of times is not acceptable in this day and age of cheaper electronics. This was the worst plane I have ever flew. The plane is old, the seat are unconfortable. No good enterterment. This plane is making flights from JNB-GRU-JNB very boring. Iit was a pleasent flight with 340-600 Now is no plesure at all. 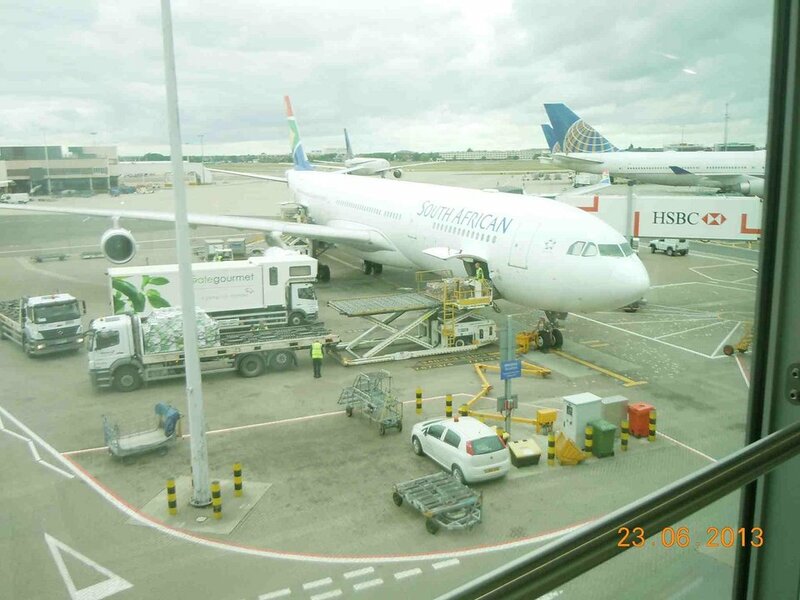 South African Airways flies 1 versions of Airbus A340-200.